Former Associate Dean of the Faculty for the Sciences, Dartmouth College. Former Chair of the Department of Biological Sciences, Dartmouth College. Graduated with a B.A. 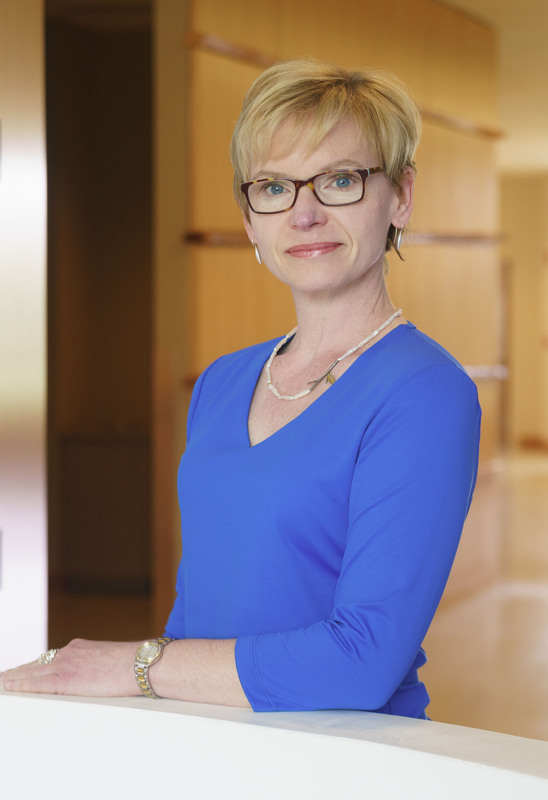 in Biology from Agnes Scott College, completed a Ph.D. in Cell and Development at Emory University and was a Post-doctoral Associate in Genetics and Cell Biology at the University of Minnesota. Cilia and flagella are found on diverse cell types including sperm cells of vertebrates and some invertebrates, unicellular protozoa, and several vertebrate epithelial cell types. In mammals, for example, motile cilia found on cells lining the brain ventricles circulate cerebrospinal fluid; cilia in the respiratory tract sweep debris from the lungs; and oviduct cilia move the fertilized egg to the uterus. In addition, epithelial cilia present early in development are involved in left-right axis determination. Some epithelial cells, such as retinal photoreceptor cells and certain renal epithelial cells, possess immotile cilia which we now know play important sensory roles in cell function. Individuals with motility impaired cilia / flagella or defects in ciliary / flagellar assembly may have any number of serious disorders including hydrocephaly, retinal degeneration, respiratory distress, polycystic kidney disease, and infertility. Despite the diversity of cell types utilizing these organelles for motile functions, the architecture and the molecules which construct ciliary and flagellar axonemes are highly conserved. The motility of these organelles requires the precise regulation of at least seven different dynein motor complexes. 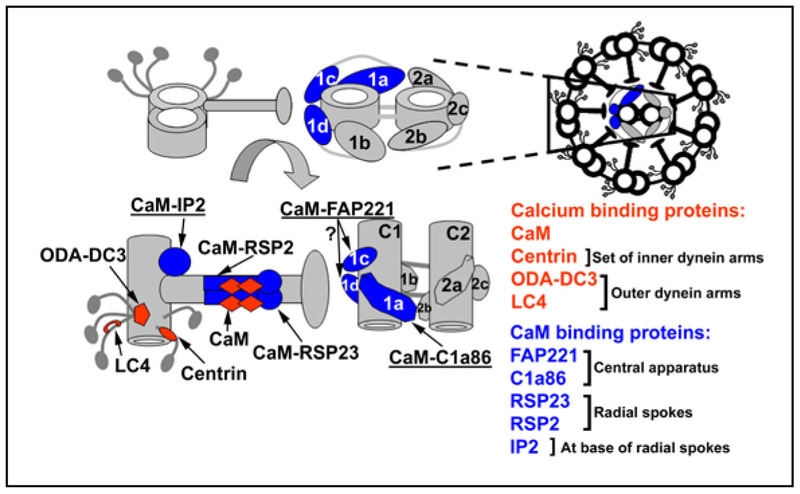 This regulation is mediated in part by a signal transduction pathway that includes second messengers such as cAMP and calcium as well as a network of kinases and phosphatases anchored to the axoneme. Our goal is to understand how these signal transduction pathways are integrated to produce the complex waveforms typical of beating cilia and flagella. Current research has focused on the signaling pathways mediated by changes in intracellular calcium concentration. Using the biflagellate green alga Chlamydomonas reinhardtii as a model system, we have the most complete and advanced array of biochemical, molecular, and genetic techniques with which to study flagellar motility. The high degree of conservation in axonemal structure and composition across species is well illustrated by the finding that the amino acid sequences of virtually all flagellar proteins in Chlamydomonas share high sequence identity with proteins predicted from the human genome sequence. In fact, virtually all of the genes in which mutations result in human disease were first identified in Chlamydomonas. For virtually all cell types with cilia and flagella, modulating ciliary and flagellar beating involves changes in intraflagellar free calcium concentration. Using Chlamydomonas as a model system, we have identified a role for calmodulin in a signal transduction pathway that regulates dynein activity. Using a highly specific antibody we generated against Chlamydomonas calmodulin, we have successfully immunoprecipitated at least three different calmodulin containing complexes and have identified the constituent polypeptides of these complexes using mass spectrometry. One of these complexes includes primary ciliary dyskinesia protein 1 (Pcdp1), a protein that when mutated in mice results in the phenotype similar to patients with primary ciliary dyskinesia. Current projects include defining a molecular mechanism for how these complexes modulate motility using a combination of biochemistry, genetics, RNAi technology and unique in vitro functional assays such as high speed video recording of beating flagella as shown below. One of the most important recent discoveries in cell biology has been the mechanism of ciliary/ flagellar assembly known as IFT or intraflagellar transport. Defects in this process can lead to a number of human diseases and even embryonic lethality. Despite recent advances in the field of IFT, we still do not have any information about a mechanism for the assembly of the central apparatus. This pair of microtubules and their associated projections is essential for wild-type ciliary motility. We have discovered that mutations in either of the two subunits of katanin, a microtubule severing protein, result in failure of the central pair to assemble. We are now uniquely poised to begin experiments that will provide answers to this longstanding and important question. Mizuno K., Dymek E.E., Smith E.F. (2016) Microtubule binding protein PACRG plays a role in regulating specific ciliary dyneins during microtubule sliding. Cytoskeleton, Dec;73(12):703-711. Loreng T.D., and Smith E.F. (2016) The Central Apparatus of Cilia and Eukaryotic Flagella. Cold Spring Harb Perspect Biol. 2016 Oct 21. Wren K.N., Craft J.M., Tritschler D., Schauer A., Patel D.K., Smith E.F., Porter M.E., Kner P., Lechtreck K.F.. (2013) A Differential Cargo-Loading Model of Ciliary Length Regulation by IFT. Current Biology, 23(24) 2463–2471. Dymek E.E., Smith E.F.. (2012) PF19 encodes the catalytic subunit of katanin, p60, and is required for assembly of the flagellar central apparatus in Chlamydomonas. Journal of Cell Science. 125(14):3357-66. Goduti D.J., Smith E.F. (2012) Analyses of functional domains within the PF6 protein of the central apparatus reveal a role for PF6 sub-complex members in regulating flagellar beat frequency. Cytoskeleton. Mar;69(3):179-94. DiPetrillo CG, Smith EF. (2011) The Pcdp1 complex coordinates the activity of dynein isoforms to produce wild-type ciliary motility. Molecular Biology of the Cell. Dec;22(23):4527-38. Dymek, E.E., T. Heuser, D. Nicastro and E.F. Smith. (2011) The CSC is required for complete radial spoke assembly and wild-type ciliary motility. Molecular Biology of the Cell 22(14):2520-31.